Who are a company of accredited solar panel fitters, who are MCS registered. We are also G83 and G59 Installation Specialists from 4kw to Megawatt installations. We can offer systems from 3.8kw to larger systems in excess of Mega Watts. We also offer a complete service from planning and design, fitting, commissioning systems and liaising with Western Power. A1 Solar UK are also members of Napit, ECA, Trust Mark, REAL and the Confederation of Roofing Contractors. We undertake work locally and Nationwide. 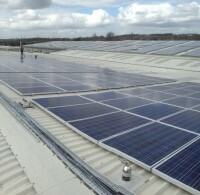 Recent commercial solar fit this was a recent commercial solar fit completed by ourselves a1 solar uk limited. this system was one of the largest fit in the uk to present amounting to 2000 panels. powering the equivalent energy to supply 60 average homes. A1 Solar UK Limited are MCS accredited engineers who supply and install Solar PV. For similar installers in this area please visit the Rugeley solar page.